Today’s photo booths are not the same as the ones a while back. If you want to have a photo booth experience all you have to do is look for the best photo booth apps for either your iPhone or iPad. Yes, Apple App Store on your iPhone or iPad has many good quality photo booth apps that’ll provide you amazing photo booth experience. You can have the same photo booth fun at home with your preferred iOS device. Unlike the real photo booth experience, you don’t have to pay to enjoy the features with these free photo booth apps for iOS. Put your hands up if you agree with my view: going through multiple apps on App Store, downloading them and only to know they don’t deserve space on your device, is a bad situation to be in. The fact is most of photo booth apps are just crap, and they don’t meet your expectations. However, if you don’t want to go through all that hectic process, I have got you covered. I have tested out multiple paid as well as free photo booth apps on my iPhone and iPad to find out the best photo booth apps for your device. So without further ado, let’s explore which are my top picks for photo booth apps on iPhone and iPad (more precisely, say, iOS devices). 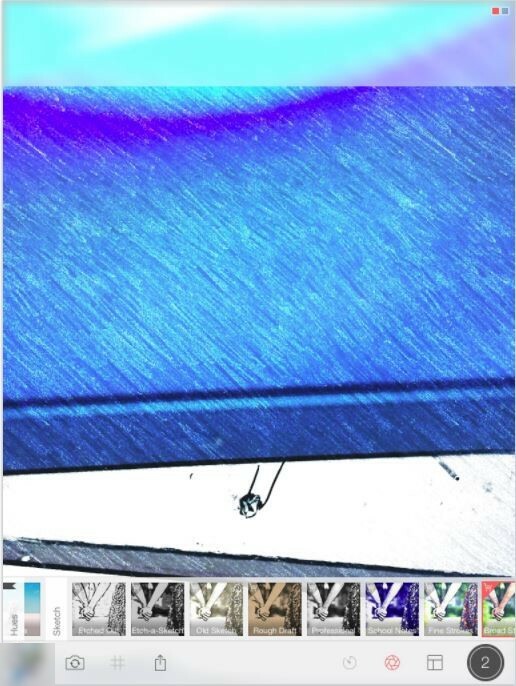 Insta Booth is a fun app that offers various effects you can use for your photo booth apps. The app will let you enjoy all of the premium features for seven days. Once the time is up, you’ll need to pay for the effects and collage patterns you want to use (only if they are a paid feature, of course). If you want a free photo booth app on your iPhone or iPad, Insta Booth is the app for you. Of course, it’s not completely free and comes with in-app purchases. Unlike other iOS apps that make you pay first to use any additional features, Insta Booth lets you use them and then decide if its something you want to purchase. You can use effects such as essentials, mirrors, classic, glamour, Black, and White, Sepia, Vintage, Portrait, Scenes, Hues, Pop-Art, and Toon. Just like the Instagram collage apps, the photo booth app also has various collage models you can choose from. You can select collage formats that can either fit one to 6 pictures. Each quantity offers multiple models you can use. You can tell which ones are paid since they will have a shopping cart at the top left. LumiBooth, Even Photo Booth is another good option despite that it doesn’t have as many options as the first photo booth app.With this app, you can only fit as many as four pictures in one layout. But LumiBooth Event Photo Booth app does have its own unique feature since it does let you move the photos around if you’re not happy with the design. Another great feature you’ll find in this photo booth app is that it allows you to either take a new picture using the device camera or you can add one from the gallery app. You can also add text to your image, just in case you want to personalize it for someone. There are various text fonts for you to choose from and it can also be in any color you want. At the bottom right, you’ll see a duplicate option where you can make a copy of whatever message you write on the image. LumiBooth Event Photo Booth app is one of the best photo booth apps for iPhone and iPad, obviously. If you’ve never been overweight then you may wonder what you would look like if you were. 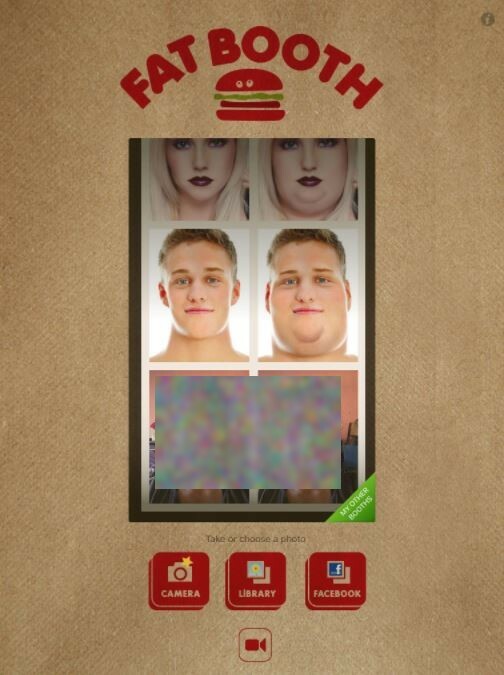 FatBooth is an iOS app that can show you what you would look like if you were fat. The photo booth app is very easy to use and is a great option for those who like to keep things simple. When you first launch the FatBooth app, you can either apply the fat effect to a picture from your device’s gallery or take a new one. There is even an option to use a picture from your Facebook account as well. It would have been nice if the app had sample pictures to use so you can see how it works, but it’s still a fun app to try. If you weren’t part of the geek squad when you were in high school, then you may be curious to see what you would look like as one. Thanks to the Geek Booth app you can see if you would have been a good-looking geek or not. 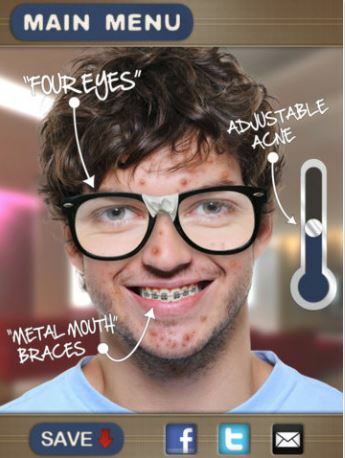 You can add effects such as braces, glasses, and acne. With this last effect, you can add as much acne as you want. There’s a slider to the right side of your display, and the higher you move it, the more acne will be added. You can either use an existing picture from your device’s gallery, or you can take a new one on the spot. Once you’re done with your creation, you can either share it on Facebook or use your Email account. 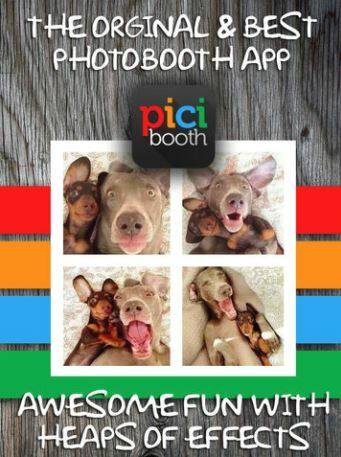 With PiciBooth there is no need to go to an actual photo booth. This photo booth app is what you’ll need to take the perfect photo booth picture. You can either use the front or rear facing camera and add all sorts of creative and fun backgrounds. There’s also the option to add another picture from your device’s gallery as the background. If you made a mistake somewhere, you could always undo it at any time. There are various filters you can apply and not to mention the frames, crop, sharpness, text, draw, color options you can choose from. Creating memes is also possible (no! you don’t need a dedicated meme generator app), so you can have even more fun with the app. Don’t forget to add stickers to your picture to give it that finishing touch. You can make them as big or small as you want and place them anywhere. The categories for the stickers would be love, frames, horror, Jersey Shore, and Crooked Arrows. The downside to the photo booth app is that it only has two formats when it comes to the layout, but it’s still worth a try. And, I’m sure, PiciBooth is a photo booth app for iPhone or iPad that won’t let you down. 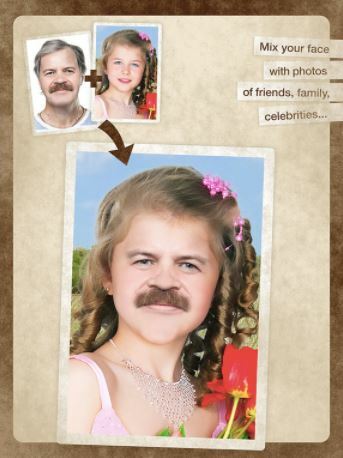 If you’ve ever wanted to know what your kids would look like (if you don’t have any already) then you should definitely give MixBooth a try. You can take a new picture or use one from your device’s gallery. There’s also the option of using a photo from your Facebook collection too. Just like face swap apps, you can either mix an image of you and someone you are with or of you and a sample picture the app comes with. To see a before and after image, just shake your device but be careful to hold to it tightly. If you like what you see then save the image to the gallery, so you can show it off to family and friends later. To get the best results, make sure to use the auto-cropping using face detection. The photo booth app also offers skin color auto-adjustment, and you don’t need an Internet connection to use the MixBooth app. That way, you can easily kill some time without having to worry about a high phone bill at the end of the month. PocketBooth Photo Booth is not a free photo booth app for iPhone and iPad, but it’s only going to set you back one dollar. It has a great design and tons of great features. The photo booth app has effects you can add that will convince everyone that the photo was really taken at a photo booth. You can choose between five integrated effects such as two border styles and two paper styles. Just like the other photo booth apps, you can also use the front and rear-facing camera. The app also features three new filters and border expansion packs and you can also add your GPS location to the picture. The PocketBooth Photo Booth app for iPhone and iPad also has a sharing feature where you can post your creation on either Facebook, Twitter, or send it by Email. Save your pictures to the camera roll so you can look at them whenever you want. Taking pictures is a lot of fun, but if you use any of the photo booth apps listed above, it’s going to be even better. 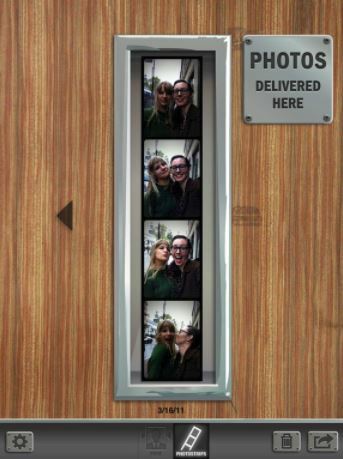 Today’s photo booth is not like it used to be since you don’t even have to leave your home to use it. You don’t even have to get off the sofa for that matter. You’ll have fun by using any of the photo booth apps for iPad and iPhone mentioned above. 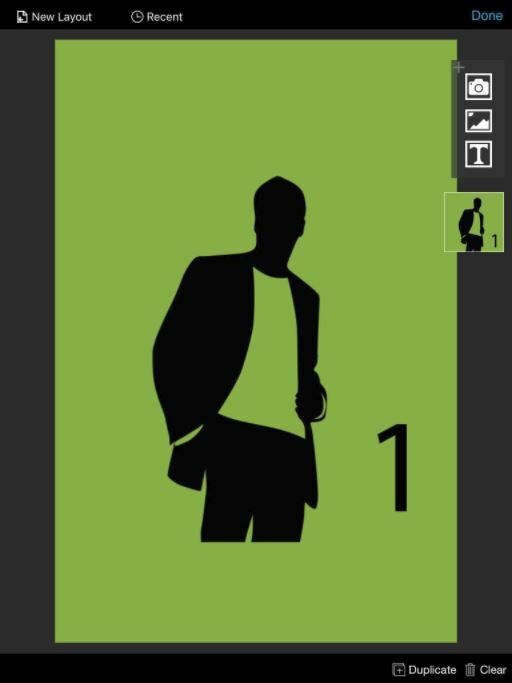 Most of them are free, but if you’re willing to pay just a dollar, the last app (PocketBooth Photo Booth) will provide you even better options and graphics as well. Just like the real photo booth, the photo booth apps also give you options to print out your pictures, but since each app works differently, the instructions will obviously be different. Which app do you think that you’re going to use first? Don’t forget to share your thoughts in the comments and tell us why you decided to go with that app.